Nature Walks have become an integral part of the daily lives of the children, families and educators at Guardian Early Learning Centre Springfield. QLD Curriculum Mentor, Bronwyn Thomson shares the experience in conjunction with the University of Southern Queensland. let us allow them to love the earth before we ask them to save it. Nature Walks at Guardian Early Learning Springfield are a natural part of our daily experience. Nature Walks is the term we use to describe our open excursion opportunities to our local parklands, available to children and educators to take up as the day unfolds. The concept of Nature Walks as open excursions which are a responsive and flexible addition to our daily routines has been developed with all stakeholders over time and through considerable research and dialogue. 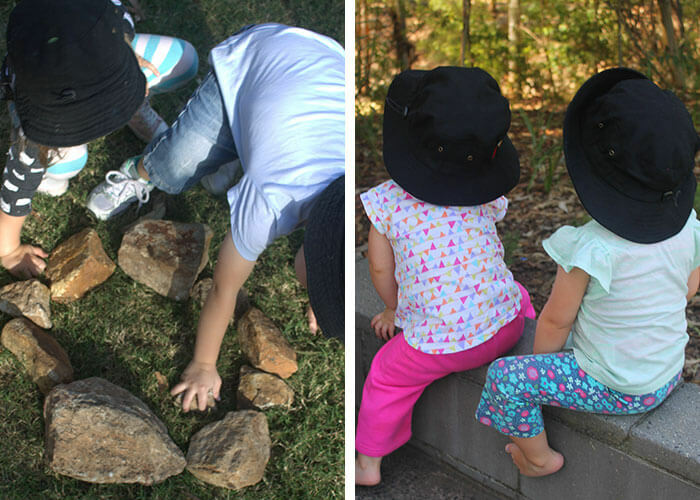 Over the last 12 months the Early Learning Springfield team of children, educators and families have continued to develop a research project on Nature Walks in partnership with University of Southern Queensland and our local Springfield community. 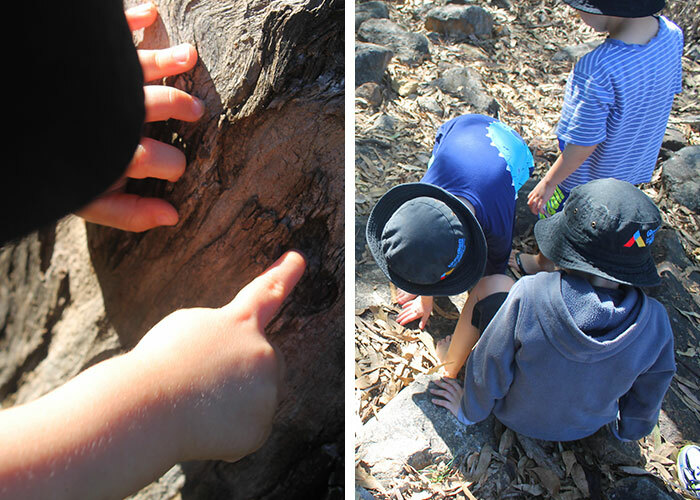 This Action Research project began as a way to investigate, learn and document together as we explored the possibilities and practicalities of Nature Walks in our Robelle Parklands. From the start we saw the strength in thinking of the Parkland as an extension of our learning environment here at the centre and we worked towards embedding this excursion experience as a natural and regular part of our routines. We see that our young children learn best when their learning is strongly connected to the community in which they live. Here at Guardian Early Learning Springfield we are so close to the gorgeous outdoor environment of the Robelle Domain. This proximity was a prompt for our initial thinking, which references the above quote by David Sobel: Could we develop environmental knowledge, respect for country and sustainable thinking within our learning community (children, educators and families) through developing environmental behaviours? The Robelle Domain is an extensive parkland which includes a diversity of natural spaces for children to explore, including grassy spaces, natural bush, endless pathways, and creek beds. There are so many experiences which become possible through accessing the adjoining parklands environment as a resource for learning. Connecting with the natural world, ownership of place, developing our sense of community, expanding our opportunity for active play and growing a strong sense of self through real life experiences are just some of the learnings we envisioned from the start for our children here. As a new centre building its identity within a developing community, our learning has grown to be so much more than unpacking and exploring the research and practice of Nature Play. These shared understandings and processes has shaped us and connected us in endless and continuing ways. Every place has a soul, an identity and seeking to discover it and relate to it means learning to recognise your own soul as well. Time seems to slow in the parklands and there is a calm that we share because we can run and rush and fall down if we want to but the places we go and the things that we see are of our choosing. And of course time flies in the parklands too… There is never enough time to go and see and so we return. The following reflection is shared with permission from a parent. The Nature Walks certainly give incentive to appreciate our surroundings that little bit more. Too often we venture outdoors without taking the time to actually explore. We forget little people haven’t experienced the beauty of the things adults overlook and take for granted trying to keep up in this busy world. So thank you Guardian for helping not only our child but all the children to appreciate nature in a different perspective. We have been fortunate to build a working relationship with the University of Southern Queensland through Dr Alice Brown and Vicki Christopher from the School of Teacher Education and Early Childhood. Alice and Vicki have been with us from the start and have guided our thinking to shape an Action Research Project exploring and supporting our Nature Walks. Through Alice and Vicki, we have had specific whole team learning (e.g. the Action Research Process), support to organise and share our thinking and access to current research through the university data bases. Our vision as a learning team was articulated form the outset as; a collaborative investigation; improving (adding to) opportunities for young children; supporting all stakeholders in shared decision making; privileging multiple voices, providing a model for best practice and sharing this model with the wider Early Childhood community. As an additional learning opportunity, Alice and Vicki have documented our centre learning journey throughout, collecting information regularly with the goal of writing an international research paper describing our experiences moving a community towards change inclusively. With the support and guidance of USQ, our whole staff have researched the curriculum of Nature Play and the processes of Action Research. We are stronger and more informed as a team of educators as a result. If the idea of Nature Walks appeal to you, why not book yourself in for a tour at Guardian Early Learning Centre – Springfield? To book a tour and to find out more about this childcare centre in QLD, head here.